It is not unusual for polycystic ovarian disease (PCOS) to be caused by weight gain, and for losing weight to reverse the disease. Losing as little as 5% of total body weight, just 7 to 20 pounds (about 3 to 9 kilos) is enough for most women who have PCOS to regain enough hormonal balance to have normal periods, lose excessive hair growth, stop acne, and ovulate normally. When the problem is a dermoid ovarian cyst, however, weight gain does not cause the problem and losing weight will not solve it. Dermoid ovarian cysts are fearsome, but they are also extremely rare. A dermoid cyst is a stem cell gone awry. Eggs are stem cells, and just as a baby eventually develops skin, teeth, and hair, a dermoid cyst in the ovary can also develop skin, teeth, and hair, even fingernails, toenails, sweat glands, and eyes. 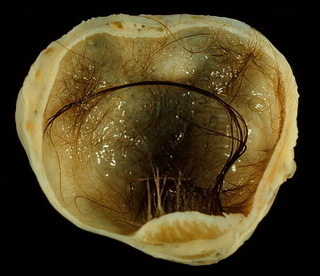 Also known as a cystic teratoma, dermoid ovarian cysts most frequently occur in women aged 15 to 40. They are covered in a leather-like capsule, and they usually remain in the ovary. Only in very rare cases are there multiple dermoid ovarian cysts. These usually migrate outside the ovary into the abdominal cavity. Other kinds of dermoid cysts are found all over the body in both men and women, but primarily on the skin and under the tongue, and without the development of well-defined body parts. In some cases dermoid cysts cause the development of "freckles" or dark spots on the skin; there are cases in which a dermoid ovarian cyst has metastasized into melanoma or squamous cell carcinoma. The development of dermoid cysts is really not due to hormones; they are stem cells gone awry. Although the idea of a dermoid ovarian cyst is horrific, treatment is straightforward. These ovarian cysts can be surgically removed, usually allowing the women undergoing the procedure to preserve fertility in the other ovary. The surgical removal of the cyst, however, requires considerable surgical skill. It is important not to break the cyst, in case it is infected, and it is also important not to let its contents leak onto adjacent tissues, since they too could become sites for the development of another dermoid cyst. Some surgeons are able to use endoscopic techniques which preclude the need for a large incision. If a dermoid ovarian cyst is stable and not causing the woman pain, it may not have to be removed right away. There is always a danger, however, that some injury (in a car crash, for instance) would burst the cyst and cause many kinds of complications. Sorness after surgery of dermoid cyst? ?